The farm horse of the Canadian countryside is the base stock for the Canadian Sport Horse. 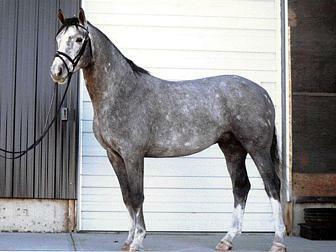 After the First World War, Thoroughbred stallions from England were made available to cross with the countryside stock, producing a more refined horse. In 1926, the Canadian Hunter, Saddle and Light Horse Improvement Society was organized. In 1933, a second organization, The Canadian Hunter Society was incorporated and a Stud Book was maintained. The two societies merged in 1970 and renamed the society to include the term "Sport Horse," a name which appropriately distinguishes this highly athletic breed. During the First World War, and as the direct result of Canada's reputation for breeding quality horses, a large percentage of Canada's horse population was shipped overseas for military use. These horses never made it back to their native land, resulting in a thin breeding stock for future Canadian horses. It wasn't until the Canadian government brought Thoroughbreds over from England that a foundation bloodline was established to create a healthy horse population again. Standing up to 16 hands high, the Canadian Sport Horse shows similar conformation to the hunters produced by the English and Irish. Over the years they have been highly refined for dressage competition, although some are still used for hunting.